As the Dow Jones Index continues to drop like a rock, the worst is yet to come. Today, investors once again plowed into the markets because they are following the Mainstream Financial advice of BUYING THE DIP. Unfortunately, those who bought the dip before yesterday’s 1,032 point drop and the 400+ point drop this afternoon, have thrown good money after bad. Of course, we could see a late day rally to calm investor’s nerves…. but we could also see an increased sell-off. Either way, I could really give a rat’s arse. Why? Well, let’s just say the Dow Jones Index has a long way to fall before it gets back to FAIR VALUE. However, my fair value is likely much lower than the Mainstream analysts’ forecasts. 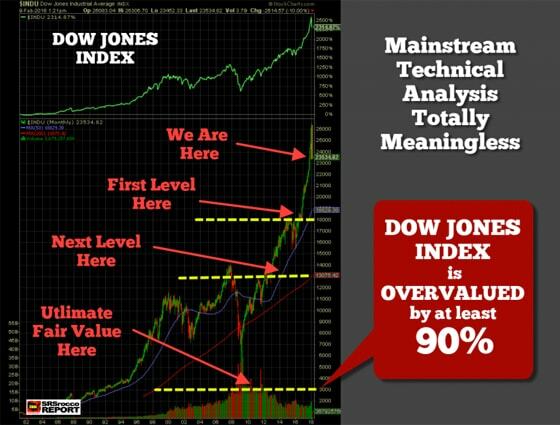 While the Dow Jones Index has already declined by 2,500 points since my first chart, I wanted to provide the different correction and crash levels as I see it taking place on the Dow Jones Index in the future. The first level the Dow Jones will reach its Support level at about 18,000 points. 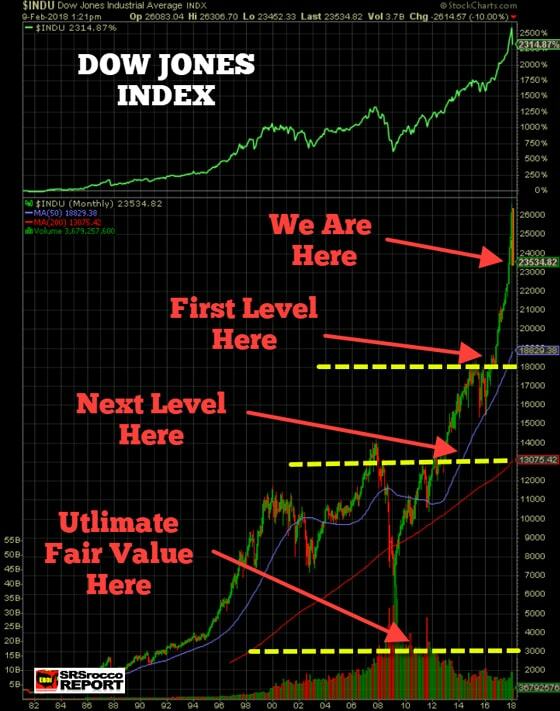 Once this level is broken, then it breaks down to the 200 Month Moving Average (RED line) at 13,000. Who knows how long it would take to get down to 13,000, but it will. As you can see, the Dow Jones Index fell below its 200 Month Moving Average in 2009, so this isn’t anything new. I will discuss this in the next video. Happy Trading to the POOR SLOBS who continue to throw money in this market.